Information: Battle of Britain Class locomotives, along with sister West Country’s were introduced in 1945 and produced through 1954. A total of 110 air-smooth cased Light Pacific’s; affectionately known or rather unkindly nick-named “Spam Cans” were built by the Southern Railway and later British Railways using many features inherited from the larger and heavier Merchant Navy Class. Details: By 1945 plans for electrification of the Southern Railway were already in progress. The Merchant Navy Class had been introduced in 1941 to fill the need for express passenger service on the busiest routes. Because of weight load restrictions and size, the Merchant Navy Class could not be used universally through-out the region. Although third rail electrics would eventually spread, a lighter weight locomotive was required to handle freight and cross country intermediate passenger services that ran through-out the region replacing an ageing fleet of T-9’s, School’s, etc. Features employed on the previous Merchant Navy Class such as the Boxpox wheels, chain drive, welded firebox construction, and electric lighting were incorporated into the considerably lighter West Country/Battle of Britain Class locomotives. Initial deliveries of a batch of thirty West Country locomotives built at Brighton Works commencing in May 1945. 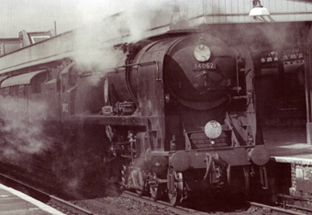 A second order of fifteen locomotives followed in 1946. With the third batch, production of the Battle of Britain locomotives commenced after a total of 48 West Country’s had been produced (17 more West Country’s were later produced before production ceased). Remaining members of the class were constructed at Brighton, Ashford, and Eastleigh with the final member of the class 34110 “66 Squadron” taking to the rails in May 1951 under British Railways auspices. In all 65 West Country’s and 45 Battle of Britain’s were produced. Names were associated with various aspects of the famous Battle of Britain fought over areas of Southern Britain and the coast during WW2. Individual locomotives included names and plaques associated with famous people such as “Winston Churchill”, aircraft “Hurricane”, and fighting squadrons. Sister West Country locomotives were typically named for town’s scattered through-out West Country region. By 1957 un-rebuilt members of the class was assigned a 7P5F rating category by British Railways. Rebuilt members received a 7P6F rating. Class members seldom saw the type of service and train loads they were capable of hauling. Liveries carried include the original Malachite Green, affectionately known as “Sunshine Green” with yellow lining was employed by the Southern Railway. All members were ultimately painted British Railways Brunswick Green with orange and black lining. Performance, maintenance, and operational cost evaluations of the original design were undertaken on the earlier Merchant Navy Class, as expectations of the design were not meeting objectives. 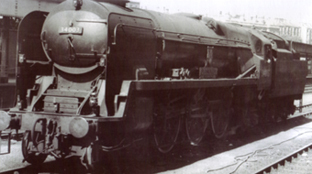 As a result the entire Merchant Navy Class was ultimately rebuilt to more conventional steam locomotive design principles strongly influenced by the then current British Railways Pacific Class standard design criteria. This resulted in a radical appearance change as air-smoothed stream-lined casings were removed, primarily for maintenance purposes. An initial order to rebuild 60 of the Light Pacific’s took place between 1957 and 1961. However, it was found that the rebuilding procedure increased the loading weight of the locomotives thereby making them redundant for their intended route availability. As the 1955 Modernisation Plan was already in progress further rebuilds were not undertaken. With their work being replaced by on-going electricification and route closures many members of the class were pre-maturely with-drawn, commencing with 10 locomotives in 1963. By the end of steam on the Southern Region in 1967, only seven locomotives were still in active duty. A total of twenty class members; including 10 of the rebuilds have been spared the breakers torch. It is unlikely that some will ever reach preservation stage. Features that made them popular during their operational years such as route availability and imposing appearance have made them popular with preservation lines and museums through-out Britain, where today they can still be enjoyed.